Hand holding a clothes dryer lint filter that is covered with lint. When used and maintained properly, clothes dryers are extremely safe appliances. But accidents still happen. In 2010, nearly 15,500 fires occurred that involved clothes dryers, according to the National Fire Prevention Association. And the NFPA says that failure to clean the clothes dryer is the leading cause of fires involving dryers. When failure to clean a dryer was a cause, the fires led to $44 million in direct property damage. 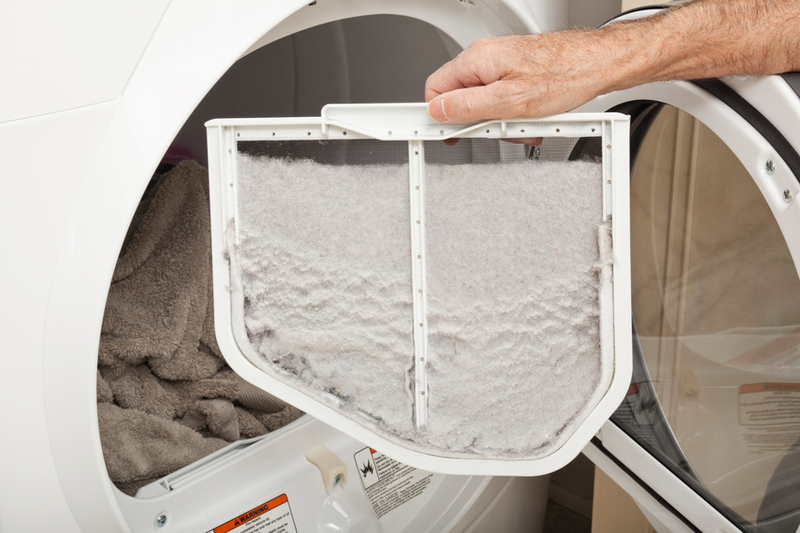 Lint filter: This easily accessible and removable piece should be cleaned after each time you use the dryer. The lint can usually be removed by hand. The filter should also be periodically cleaned with a nylon brush and hot, soapy water to remove residue. Don’t use your dryer if the lint filter is blocked, damaged or missing. Contact your dryer’s manufacturer or a licensed service technician to ask about a replacement filter. Interior and venting system: This is the venting material that leads from your dryer to your dryer vent, which typically is outside the home. The system should be cleaned once a year by a qualified service technician. It can become blocked if it isn’t cleaned regularly, leading to longer drying times. If you’re noticing clothes are taking longer to dry, it may be time for cleaning. Behind the dryer: Lint can build up behind your dryer as well. Check the rear of your appliance regularly and remove any trapped lint. Drum: Remove any lint that has collected in and around the drum. Anything that has come into contact with flammable liquid: This includes materials that have been used to clean up gasoline, alcohol, solvents, cooking oil or other types of flammable material. Most can’t be completely removed in a wash cycle, meaning the flammable material remains in the fabric. Dry these items outdoors away from heat. Even if the item makes it through a drying cycle, a fire risk remains for hours afterward. Foam, rubber, plastic or other heat-sensitive material: These materials aren’t made to withstand the heat of a dryer cycle. They should be line-dried. If you are using a dryer, use a no-heat cycle. Glass fiber materials: Follow the manufacturer’s care instructions. Use rigid or semi-rigid sheet metal venting material. This will reduce airflow and reduce dryer times. Use the shortest, straightest possible vent length, and use a louvered or box hood-style to cap your outside vent. Check the air flow. You should be able to feel the air flowing out of the dryer vent to the outdoors when the dryer is on. Regularly inspect the venting system behind the dryer. Replace any damaged or crushed pieces.